Go to https://app.dermengine.com and click the Reset Here button next to the "Forgot Password?" text. 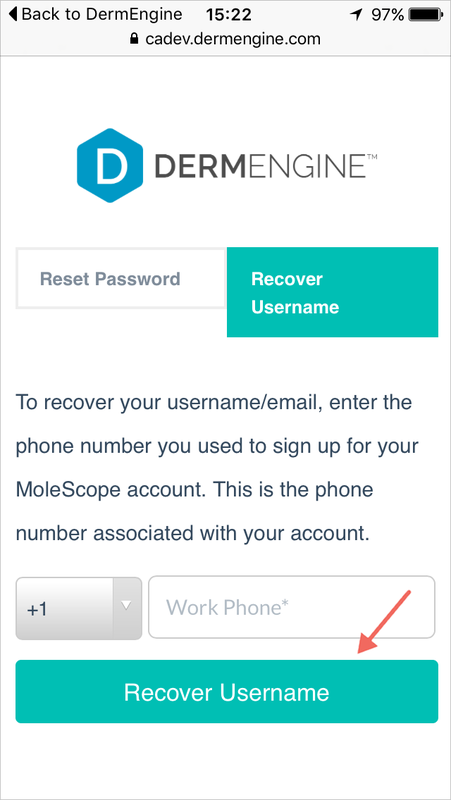 You will be directed to https://app.dermengine.com/account/password/reset/ Click the Recover Username button. Submit your phone number associated with your account and select Recover Username. If you need further assistance, please email us at support@metaoptima.com. To learn how to recover your password, click here. Go to the DermEngine app and tap Forgot Password. Switch to the Recover Username tab. Enter your phone number that is associated with your account and tap Recover Username. Follow the on-screen instructions to receive your login email.